Given my accent, I'm often asked in these United States "Where are you from?" to which I counter-ask "Do you mean where was I born? or do you mean where did I grow up? or do you mean where did I immigrate from? ", the answers to which are London England, Cape Town South Africa, and Nadi (pronounced Nandee) Fiji. When I tell them I immigrated to these United States from the Fiji islands, people ask incredulously "Fiji? Why would anyone want to leave Fiji to come to the United States?". So I tell them. "Paradise is not enough.". That's not to disparage the question. Nor is it to give it a smart alecky answer. Nor is it to disparage Fiji. Really it isn't. Neither is it an answer I give lightly. Initially when I was asked the question, I was always caught unprepared. The truth is back then I didn't have an answer. Opening and closing my mouth like a goldfish, I said something like I was just ... well ... traveling ... I suppose ... Whatever I said wasn't authentic. It was an answer for answering's sake. And the thing about a paradise, I would agree, is it should be enough. Heck, that's almost biblical isn't it? Yet it was many years after I emigrated from Fiji and many years after I visited more paradises that I realized paradise, in and of itself, isn't enough. And just recently I finally figured out why. To prepare for writing this essay I considered strolling through a vineyard reading e e cummings poetry. 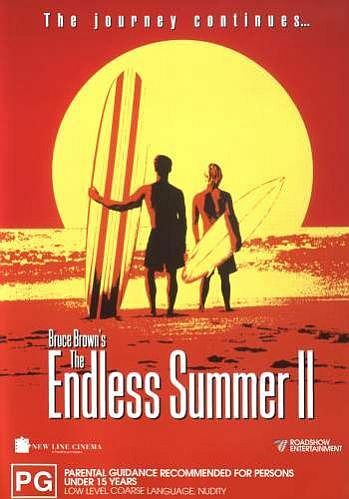 I settled instead for watching Bruce Brown's gorgeously crafted The Endless Summer II, the sequel to his iconic, mesmerizing The Endless Summer which I have on VHS. The tape has been worn so thin after so many views it's in danger of disintegrating completely. The two Endless Summer films are more, much more than merely surf movies. They're veritable collections, travelogues if you will, not just showcasing surfing perfection but also showcasing a veritable plethora of paradises which bejewel Planet Earth. I've been to many of these locations in my own travels. For years, traveling to one paradise after another was enough. Paradise itself was enough. Something happens to me, something wonderful happens to me in a paradise (I assume it happens to everyone). In this conversation I'd like to propose this distinction: what happens in a paradise, the bliss, the joy, the celebration, happens purely as a function of our senses and not as a function of what we're responsible for creating and expressing, and I say it's not enough. Please be with me now and allow me to expand on this idea. In a paradise, vistas are stunningly beautiful to look at. Ocean spray and tropical fragrant vegetation tantalize the nostrils. Balmy air and warm lagoon waters caress the skin. Sounds of the wind, waves, and exotic birds sing a symphony for the ears. And as for taste: until you've picked your own ripe bananas, coconuts, and papayas from a tree, until you've grilled the fish you caught yourself over the coals of a driftwood fire on a beach at sunset, you can't even begin to consider yourself to be a gourmet. Not really. This is paradise, yes? A treat - no, a banquet for the senses. And along with this treat, along with this banquet for the senses comes the feeling of well being, no worries mate, the spirit of Aloha, and the ecstasy and ease of friendship and romance blooming and thriving in this environment in these conditions. After years of traveling I began to notice paradise is not enough. To be sure, I didn't articulate it that way at first. It was something which came on me later gradually, a feeling I was having which I wasn't supposed to be having, an unexpressed feeling which (had I spoken it out loud) would have said "There's got to be more than this ...". Paradise should be enough, right? But actually no: it wasn't. Eventually I came right out and admitted it. Yet it wasn't until a few more years had passed before I figured out why it wasn't enough. It wasn't until my arrival in these United States and subsequently a chance encounter with Werner Erhard when I started to let in the possibility that no part of my appreciation of paradise had anything to do with me at all. All of what I thought was my appreciation of paradise was simply neurons firing in my brain automatically. I saw for the first time (which is to say I was willing to look at for the first time) there was nothing created or Self expressed at all about my experience of paradise. And that's why paradise is not enough. As I mature listening Werner, what I get is I can be in a paradise and have it be a neurons firing in my brain automatic non-created non-Self expressed experience ... OR ... I can be in a paradise and have it be an exquisitely created act of Self expression. The way I have being in a paradise be an exquisitely created act of Self expression is I open my mouth and speak - that is to say I take responsibility for creating paradise ie for generating it with my language. That's the difference between the experience of paradise as a purely automatic set of responses provided by my senses, as opposed to the experience of paradise as a created act of Self expression I generate with my language. Listen: it takes guts, it takes something big to get this. It takes giving up playing small to get this. I can have a paradise be a place which entertains, distracts, and soothes me - in a particular location when I'm on vacation. Or I can have paradise be a place I generate with my language anywhere I am whatever I'm doing. It's a simple choice I get to make. Speaking for myself (and only for myself) I could also say it's a simple no brainer choice I get to make - but I'll leave the imposition of that particular descriptor up to you. When I started looking at this idea Werner's way, I noticed I can have an experience of being in a paradise when I'm in an environment which has certain physical characteristics which interact with my senses in such a way as to fire a certain set of neurons in my brain, giving me the automatic experience of paradise ... OR ... I can be in a physical paradise (automatic paradise) and at the same time have it be an exquisitely created act of Self expression. The way I have being in a physical paradise be an exquisitely created act of Self expression is I speak it this way. Speaking it this way is an act of pure intention. Simply being in a physical paradise isn't enough. Simply being in a physical paradise doesn't guarantee I'll take responsibility for speaking it this way. Unlike automatic paradises which are only available when I'm surrounded by a particular set of geographical conditions which trigger the appropriate sensory experiences, the paradise I generate with my language doesn't have any such limitations. It's not restricted to any particular geography. Of the two, what I realized is it's the automatic paradise which is not enough. Of the two, what I realized is it's the automatic paradise which isn't as readily and as globally available as the paradise I generate with my language. Fiji and the surfing locations of The Endless Summer films are paradises - to that I can personally attest. But (and this is the big but): one, by default they're automatic paradises, two, they're only available ... well ... in Fiji and in the surfing locations of The Endless Summer films. That's waaay too restrictive for me, way too limiting, way too constraining. It's not enough. Paradise I generate with my language as a created act of Self expression on the other hand, is enough. Moreover it's available everywhere I am. It's available everywhere we are. It's even more than that actually. It's I can take the paradise I generate with my language as a created act of Self expression, to the world. It's I can take it out into the world (as Werner Erhard may have said). In a word, I can share the paradise I generate with my language as a created act of Self expression anywhere and everywhere in the world. But I can only take the Fijian paradise to Fiji, even given the heart melting beauty of the paradise which is the Fiji islands. This is why I say that paradise is not enough. In the future when people ask incredulously "Fiji? Why would anyone want to leave Fiji to come to the United States?" I'll keep telling them "Paradise is not enough". Then if they ask me "What do you mean Laurence?" I'll refer them to this conversation you and I are now completing which distinguishes the automatic paradise from the paradise I generate with my language as a created act of Self expression, and so establishes the context for my assertion.